Number of windows less than 8ft wide or 4m2A Single Inertia Sensor can cover the entire Window, with multiple openings for example, with an area up to 4m2, from external forced entry once the window is closed by detecting vibrations and impulses to the frame or the glass during intrusion. Only one opening is protected with a contact as standard. The purpose of the contact is only to indicate the window is still open at the time of setting the alarm. See below if you would like the option of additional contacts to cover other openings. Number of Windows greater than 8ft wide or 4m2This window will require an additional sensor due to the size of the window. Two Inertia Sensors are now allowed for in our quotation. The two openings are protected with a contact as standard. The purpose of the contact(s) is only to indicate the window(s) are still open at the time of setting the alarm. See below if further additional contacts required. Number of Bay WindowsTypically Bay windows are quite large in size and have multiple changes in the angle of the frame and typically have multiple openings. Two Inertia Sensors are allowed for in our quotation for each Bay Window listed. Number of Velux WindowsA Single Magnetic Contact is used to protect a Velux window in order to limit false activations from precipitation (i.e. heavy rain, hail) or animal interaction (i.e. Bird strike). The purpose of the contact is only to indicate the window is still open at the time of setting the alarm. Additional Contacts on Windows (Optional Extra) Windows are protected from external forced entry with a single Inertia Sensor for up to 4m2. Inertia sensors can come with a magnetic contact in a single unit that will further protect a single opening in that frame so that the window can’t be left open before setting the alarm (Shown here on the upper RHS of the above image). If there is a second opening (Shown here on the LHS of the image above) and you wish to have it protected with an additional contact, add the number of additional openings you require. Additional Wireless Inertia/Shock Sensor (€73)The 1070 is a dual system that can accommodate both wired and wireless devices. If there is additional doors or windows not pre-wired these can be protected using a wireless inertia sensor. Wireless devices are also an ideal work around for damaged cabling. Additional Wireless Contact(€56)The 1070 is a dual system that can accommodate both wired and wireless devices. If there is an additional Velux window not pre-wired or a damaged cable, these areas can be protected using a wireless contact. HKC Wireless Key FOB (€47)A very useful device for the end user to control their alarm system. Remote arm and disarm your system along with a remote panic button. However you must be within range of the house. Interlinked Smoke Detector (€112)An interlinked smoke detector can be remotely monitored through your intruder alarm. If being monitored by an Alarm Receiving Centre notification to the Fire Brigade can be made upon signal being received to ensure an immediate response. 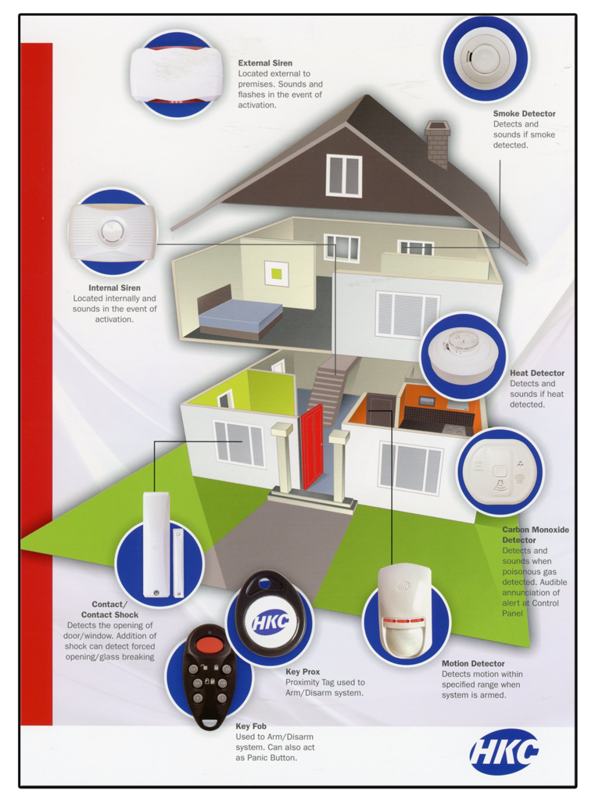 Interlinked Heat Detector (€118)An interlinked heat detector can be remotely monitored through your intruder alarm. If being monitored by an Alarm Receiving Centre notification to the Fire Brigade can be made upon signal being received to ensure an immediate response. Dummy (Decoy) Bellbox (€28)Installed as a visual deterrent to show the premises has an installed intruder alarm system by a reputable installer. All Lara Decoy Bellboxs are branded and look the same as the primary bellbox. Should be considered if home premises is very large. Click here for more monitoring options.